Korri McFann is the Worldwide Marketing & Business Development Director at Disney’s Fairy Tale Weddings & Honeymoons and has kindly agreed to answer our questions on Disney’s Fairy Tale Weddings. For those unsure on the role of wedding planner, what services do you provide to the bride & groom? The role of a Disney Wedding Planner is to hold the hand of couples throughout their entire wedding planning process. Disney Wedding Planners are here to help plan the event details as well as allow couples to truly relax and be a guest at their Wedding. Not only do our couples get a dedicated wedding planner but a dedicated team of experts, including a Disney Wedding Consultant, Wedding Wedding Planner and Floral and Décor Specialist. Our dedicated team of experts is here to make the planning process easy, and more importantly, fun! Disney’s Fairy Tale Weddings truly is a ‘one-stop-shop’ for all your planning needs! Walt Disney World® Resort offers floral, photo, video, transportation, culinary and entertainment that work perfectly together so you don’t have to! Franck’s Bridal Studio- Couples can meet with their Disney Wedding Specialist to select all the elements that comprise their storybook wedding: music, entertainment, photography, candelabras, centerpieces, sample specialty linens, fresh floral arrangements, world-class cuisine, cakes and guest books. Facebook Application – This brand-new application gives our couples the chance to create an online community with their family and friends to announce their wedding day. From this tool, they will be able to create a wedding website, send save-the-dates, manage their Guest list, interact with friends and family and share photos along the way. Virtual Venue Tool – This new tool allows couples to virtually see all of the available venues for their most special day at Walt Disney World. Couples can also experience a Google Earth ‘fly thru’ to feel like they are there in person to choose the perfect venues for their event. How long have you worked for DFTW? I have worked for Disney’s Fairy Tale Weddings for almost 15 years. It has been such a great career that has allowed me to play a role in making couples dreams come true! In fact, many of our Disney Wedding Planning team also have worked at Disney’s Fairy Tale Weddings for more than 10 years, and even more with Walt Disney World. I have found that myself and many of my colleagues are all very passionate about the work we do in weddings. Take us through a typical day in the life of a Disney’s Fairy Tale Wedding planner. A typical day of a wedding planner can vary but I will take you through the most important moments. First is getting to know our couples as individuals in the initial stages of the wedding planning process. This is one of my personal favorites moments! Every couple is unique and wants their wedding to be a reflection of their personalities and who they are as a couple. It is our teams job to make recommendations on how to make the event a reflection of them on their wedding day. This is the fun part for our team as we plan with them we can recommend a variety of different ideas for their event based on interests, likes and personality. This would be achieved during the entire process but especially during a “planning session” with our team. This is when we spend hours talking about the overall event goals, color inspiration for the event, event flow of the day, food & beverage selections, entertainment, floral and all other details that could go into their event. The planning session day to me is similar to the process of building a house, where we look at the framework of the event and then start to outline the specifics per “room” to make the event come together. The second most exciting day, which is never typical, is the day of the wedding. This is the big moment!!!! This is normally an early day for our team starting with hair & makeup, then photos, seeing the florist set the décor for the ceremony, then the room start to be set and then we are ready to go for the day. We meet the bride and have a dedicated wedding team with the couple to ensure they get where they are needed. We will typically start with photos, and then it is off to the big moment – the ceremony. Typically couples are a little nervous before the wedding with all of the excitement going on around them and then seem to get more relaxed after the ceremony. Our weddings team get the guests seated, starts the processional and then the bride goes down the isle. The next part is my favorite part of the day! This is what we call the ‘staged exit’, which happens right after the recessional at Disney’s Wedding Pavilion. Our team invites the wedding guests to come out of Disney’s Wedding Pavilion to line both sides of the bridge. Then the couple walks over the bridge and sometimes stop for private fireworks, a kiss and then continues to walk through all of their guests with a wonderful petal exit overhead. 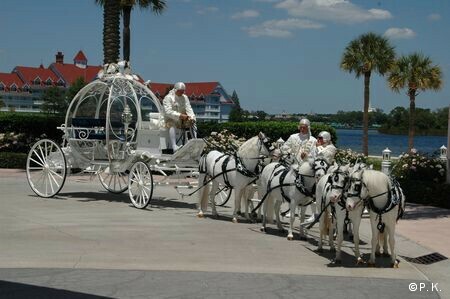 Sometimes you will even have Cinderella’s Coach waiting for the couple and the wedding guests are blown away by seeing this when they come out of Disney’s Wedding Pavilion. This is my favorite part seeing the couple receive ‘well wishes’ and get into Cinderella’s Coach for photos……then the wedding couples come back in for photos wedding guests go over for a cocktail reception and then into the dinner room for the big celebration. Which aspects of the job do you get the most satisfaction from? My favorite part is helping a couple create an event that is their story. This can be as simple as a color scheme, an amazing menu that reflects their heritage, or special entertainment and special touches that reflect themselves as a couple. That is when you know you have helped to plan a great wedding! What is it that sets a Disney Fairy Tale Wedding and its planning function above many others in the industry? I think what sets us above all others within the industry is our unmatched expertise of working with couples from all over the globe to plan their destination wedding. Our planning services and one-stop-shopping services make us a superior destination when it comes to planning an amazing event. Our expertise and entertainment options are endless which definitely sets us apart. Weddings, as we know, can be small intimate affairs or grand, showpiece events. How does the job differ when dealing with a smaller group compared to those at the other end of the scale? Believe it or not planning a wedding is planning a wedding. Although some wedding events may be bigger with more guests and have more elements, all weddings still require the same attention to detail regardless of the numbers of guests. So in my opinion they take the same effort. Can you tell us a little about the most elaborate wedding you’ve ever put together? It is hard to choose one as they all have such a special. We have done some over the top events for TV specials which come to mind. The DREAM WEDDING event was a promotion where we gave away a wedding in front of Cinderella Castle at Magic Kingdom® Park on Valentine’s Day 2007, during park hours. It was a beautiful day with a lot of extra elements that we partnered together to make happen. This event comes top of mind because we not only married the couple in Magic Kingdom Park, but produced a TV show at the same time which was a lot of fun. We have seen a lot of events over the years, but the best weddings are when couples relax and get enjoy their event. It is about the couples joining as one family and I still tear up when I see a bride go down the aisle. I guess that is why I am still in this business. Yes, we are very prepared for this and always have a back-up plan for every wedding. We hope for perfect weather for all our couples but if this is not the case we go into the back-up plan that our couples are well aware of prior to the day of the wedding. What’s your personal favorite wedding venue at WDW? My personal favorite is Disney’s Wedding Pavilion. It is so beautiful and truly a perfect ceremony location. It has a beautiful stain glass window overlooking Cinderella Castle which makes for amazing photos….it doesn’t get much better than that for a fairy tale ending. What tips would you offer to brides planning a Disney wedding? Being engaged is very overwhelming, but it is very important to share with our team what is most important to you. The more our team knows the better we can help to make your day perfect. My biggest advise for the wedding day is to let go….this is critical to allow us to take on the planning, so you can truly be a guest at your own wedding. What characteristics or strengths would anyone who wished to become a Disney wedding planner need to have to become a successful applicant? Very detailed oriented, good people skills, able to multitask and handles the stress of putting on an event well. We are looking for the best of the best to fill these roles since they are taking care of our guests at this once-in-a-lifetime event. Are wedding planners involved in any other events organizations besides marriages? We dedicated our team to planning weddings, vow renewal and commitment ceremony events. I guess you can say we are one of the few who get to think about weddings 365 days of the year! If you had to choose another job to do at WDW, what would it be? I am very lucky that I found my passion in weddings 15 years ago at Walt Disney World and somehow made it happen. I am proud to say that I have worked my way up, from my entry level position, so I understand all aspects of the weddings business, I now have the chance to be leader on the team. I have found my dream job and really love what I do! This entry was posted in Disney Weddings by Nick. Bookmark the permalink. Where do you apply to become a Disney wedding planner ?.